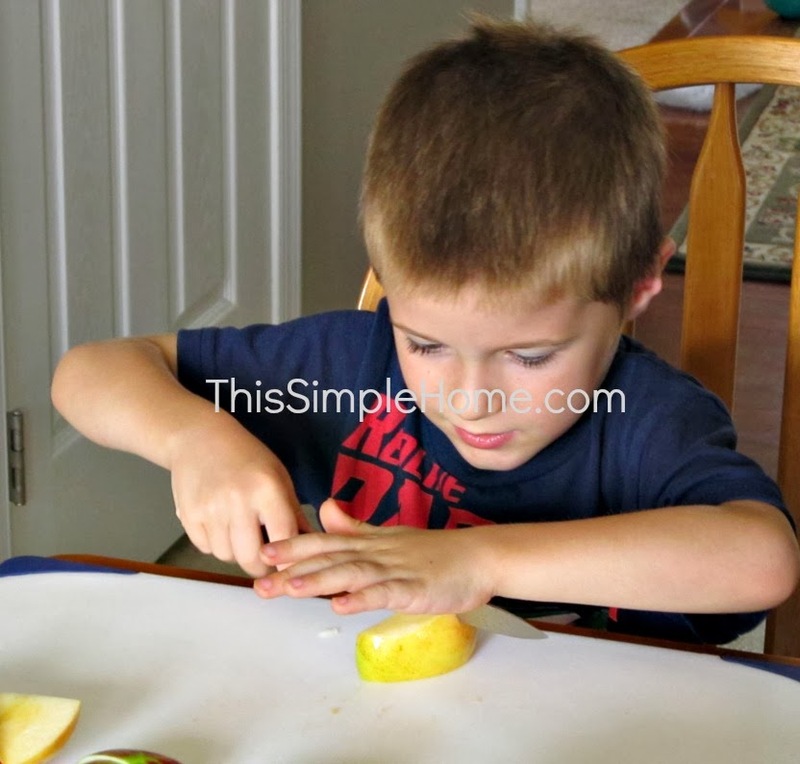 Clean your counters and make a working area for yourself and your helpers. Gather your supplies. My work area has my large cutting board (from IKEA...love it. It's much cheaper at the store than on Amazon), sharpened knife, large pot, "garbage" bowl, and my washed apples. 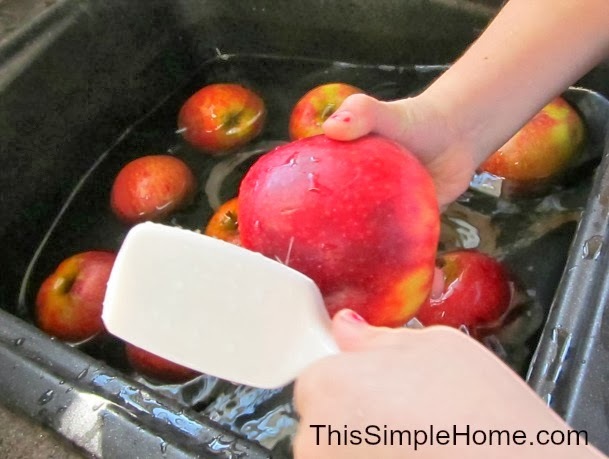 Put a half inch of apple juice or water in the bottom of your big pot where you will cook the apples. 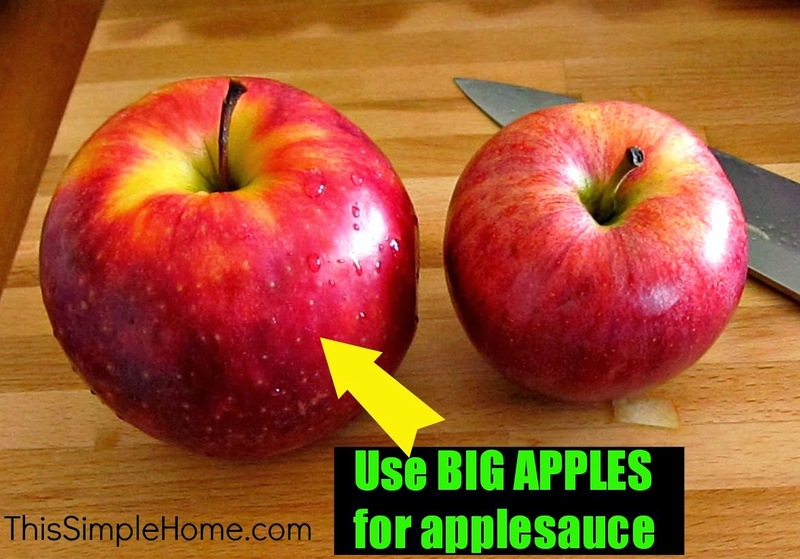 When choosing your apples, choose an apple that is good for sauce. If you like, choose BIG apples. They are a lot less work for applesauce (chopping), though it does make for the sauce a bit more watery. I like to use two types and mix them together. I am not always consistent, but this last time, I think I used Jonagold and Braeburn. Below you can see the size difference between the orchard (Braeburn?) apple and the grocery store (Gala? that we use for snacking). Also, a note on quality of apples. For applesauce, I buy seconds. My orchard sells a half-bushel of apples of seconds for less than $10 compared to the regular apples at $20 for a half-bushel. I have found that some apples don't even have any bad parts, but they do need to be examined well. Chop the apples. 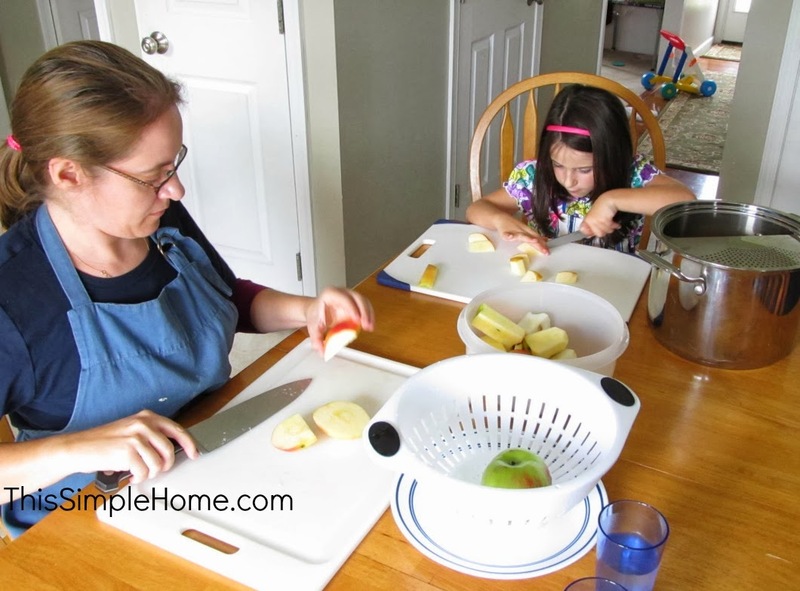 (The picture below is from when we made applesauce in August before I had my BIG cutting board.) With Little Sister at rest time (and ONLY with her out of the way), I took the opportunity to encourage the Big Kids to properly use sharp knives. This was the first real lesson when they were four and six years of age. They both worked carefully and responsibly. (They did not cut at the same time, but took turns. Quite honestly, their efforts weren't really needed, but one day they will be. You see, I first cut the apple into four pieces, plus the core. The children then cut the larger pieces into two pieces for quicker cooking. And then cut some more apples. Once you have your pot full of apples (don't forget the bit of water/juice in the bottom), put the apples on the stove to cook, with a lid on. I usually begin my apples on medium. Once the water is bubbling a bit, I reduce the heat to low or low-medium. Cooking time varies, but there is always a wait. Once the apples are mushy, they are ready to go through the mill. If you like chunky applesauce, you can just cook the apples down which is super easy. Since we like our applesauce smooth, we put it through the Kitchen Aid fruit strainer (or any food mill). The hand-crank food mill is perfect for the children to help. Then we add just a touch of cinnamon and sugar. Some apples are sweet; others are tart. Because of this, just go by taste for how much sugar to add. 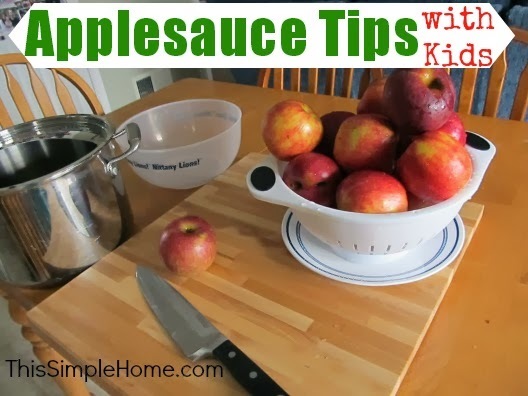 It wasn't too long ago that I made applesauce after the children were in their rooms for rest time. I have to say, it is a lot more fun to do it together. In January when I made the applesauce Little Sister (age 2) was awake, so the children only washed, dried, and delivered the apples to me. BUT it was still helpful AND fun for the family. Do you include your children in any "grown-up" activities? I didn't realize the effort that goes into homemade applesauce. But I bet it tastes and smells wonderful. I'm visiting from Sverve. Glad to stop in. Nicole, I'm sure you could do it in just an hour by making a small batch...I just make a day's work of it! I sometimes see recipes using Apple Butter. What is this and how is it made.